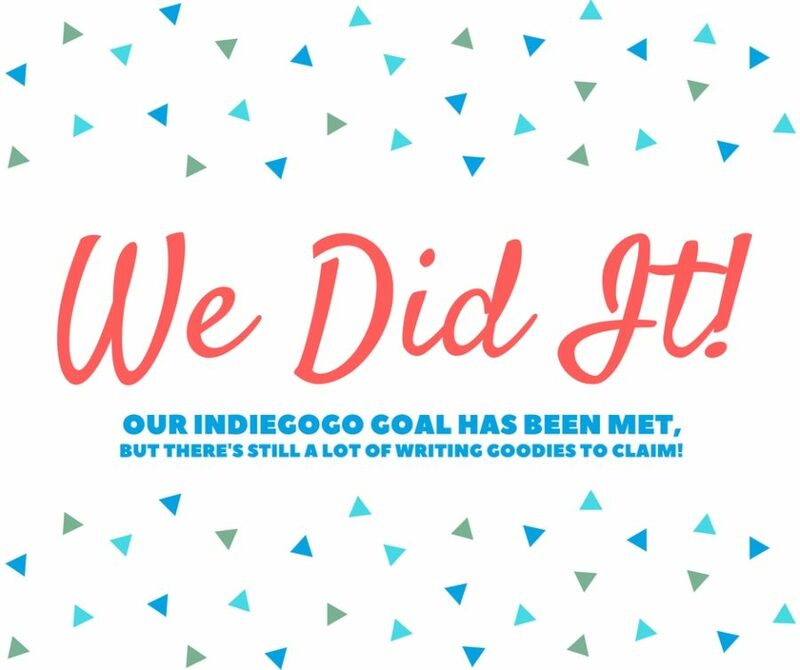 In case you missed it, yesterday we passed our Indiegogo goal! Thank you to everyone who made this possible — we are enormously grateful to all the glorious folk who have contributed to the campaign. You guys rocks our socks off. $20 USD Query Crit – Critique from Will Taylor, MG author whose debut, Maggie and Abby’s Neverending Pillow Fort, comes out in 2018. His query to his agent was so good, she uses it as an example at writing conferences. Includes Full Conference Admission. $25 USD Query Crit – Query critique from Sarah Glenn Marsh, author of picture books and YA fantasy novels, including Fear the Drowning Deep, which debuted in October 2016. Includes Full Conference Admission. $25 USD Query Crit – Query critique from Natasha Razi, Disability In Kidlit (@DisabilityInLit) editor, team member of LGBTQIA+ blog GayYA.org (@thegayYA), and a literary agency intern. Includes Full Conference Admission. $25 USD Query Crit – Query critique from Dee Romito, author of MG novels including The BFF Bucket List, which debuted in May 2016. Includes Full Conference Admission. $25 USD Query Crit – Query critique from Rachel Charlee Hoffman. A freelance writer and editor, Charlee has worked for literary agencies and publishing houses alike, most recently The Bent Agency and Harlequin Teen. Includes Full Conference Admission. $25 USD Query/First 2 Pgs – Query OR first 2 pages (your choice) critique from Mary Kole, a freelance editor who was previously a literary agent with Andrea Brown Lit and Movable Type Management. Includes Full Conference Admission. $25 USD Query Crit – Query critique (PB, MG, or graphic novels) by Clarissa Wong, an editor at HarperCollins Children’s, previously with Feminist Press, Abrams ComicArts/Appleseed, and Disney Publishing. Includes Full Conference Admission. $25 USD Query Crit – Query critique from Patrice Caldwell, editorial assistant at Scholastic and writer of YA and MG fiction. Includes Full Conference Admission. $35 USD Query Crit – Query critique from C.J. Redwine, NYT bestselling author of YA fantasy novels, including The Shadow Queen, The Wish Granter, and the Defiance trilogy. Includes Full Conference Admission. $35 USD First 5 Pgs – First 5 pages critique from Dee Romito, author of MG novels including The BFF Bucket List, which debuted in May 2016. Includes Full Conference Admission. $35 USD First 5 Pgs – First 5 pages critique from Rachel Charlee Hoffman. A freelance writer and editor, Charlee has worked for literary agencies and publishing houses alike, most recently The Bent Agency and Harlequin Teen. Includes Full Conference Admission. $35 USD First 5 Pgs – Critique and sensitivity read of first 5 pages from Karuna Riazi, author of MG novel The Gauntlet, forthcoming from Salaam Reads/Simon & Schuster. Includes Full Conference Admission. Note: Karuna will read for any/all of Muslim representation, Bangladeshi-American representation, and biracial/interfaith families. $35 USD First 5 – First 5 pages critique from Norma Perez-Hernandez, acquiring editor and editorial assistant at Kensington Publishing. Includes Full Conference Admission. $35 USD PB Manuscript – Full PB manuscript critique (max 800 words) from Lindsay M. Ward, author/illustrator of multiple picture books including When Blue Met Egg and Henry Finds His Word. Includes Full Conference Admission. Note: You must have a finished manuscript ready to be sent! $40 USD Nonfic proposal – Nonfiction proposal critique from Paige Hazzan, editor of children’s nonfiction and reference books at Scholastic. Includes Full Conference Admission. Note: Does not include picture books. $55 USD Query Crit – Query critique from Rahul Kanakia, author of short stories and the novel Enter Title Here, which debuted in August 2016. Includes Full Conference Admission. $55 USD First Chapter – First chapter critique from Frank L. Cole, author of nine books, including The Afterlife Academy and The World’s Greatest Adventure Machine. Includes Full Conference Admission. $55 USD First 10 Pgs – First 10 pages critique from Linda Camacho, currently an agent at Prospect Agency, previously with Random House and Penguin. Includes Full Conference Admission. $55 USD PB Manuscript – Full PB manuscript critique from Celia Lee, editor at Cartwheel Books, an imprint of Scholastic. Includes Full Conference Admission. Note: You must have a finished manuscript ready to be sent! $55 USD First 10 Pgs – First 10 pages critique (PB, MG, or graphic novels) by Clarissa Wong, an editor at HarperCollins Children’s, previously with Feminist Press, Abrams ComicArts/Appleseed, and Disney Publishing. Includes Full Conference Admission. $60 USD First 15 Pgs – First 15 pages critique from Natasha Razi, Disability In Kidlit (@DisabilityInLit) editor, team member of LGBTQIA+ blog GayYA.org (@thegayYA), and a literary agency intern. Includes Full Conference Admission. $65 USD Fanfic commission – Commission of a fanfic of your favorite fictional characters from Nita Tyndall, team member of LGBTQIA+ blog GayYA.org (@thegayYA) and WeNeedDiverseBooks (diversebooks.org), and agented YA writer. Includes Full Conference Admission. $105 USD First 5 Pgs – First 5 pages critique from Rahul Kanakia, author of short stories and the novel Enter Title Here, which debuted in August 2016. Includes Full Conference Admission. $105 USD First 50 Pgs – First 50 pages critique from Rachel Charlee Hoffman. A freelance writer and editor, Charlee has worked for literary agencies and publishing houses alike, most recently The Bent Agency and Harlequin Teen. Includes Full Conference Admission. $105 USD First 50 Pgs – First 50 pages critique from Patrice Caldwell, editorial assistant at Scholastic and writer of YA and MG fiction. Includes Full Conference Admission. $370 USD Sensitivity read – Sensitivity read of full manuscript (no length limit) from Nita Tyndall, team member of LGBTQIA+ blog GayYA.org (@thegayYA) and WeNeedDiverseBooks (diversebooks.org), and agented YA writer. Includes Full Conference Admission. $370 USD Sensitivity Read – Sensitivity read of full manuscript (no length limit) from Karuna Riazi, author of MG novel The Gauntlet, forthcoming from Salaam Reads/Simon & Schuster. Includes Full Conference Admission. Note: Must have a completed manuscript ready to be sent! Karuna will read for any/all of Muslim representation, Bangladeshi-American representation, and biracial/interfaith families. $525 USD Part/Full MS – Partial or full manuscript critique from Mindy McGinnis, author of YA novels, including Not a Drop to Drink, A Madness So Discreet, and most recently, The Female of the Species. Includes Full Conference Admission. Note: This perk is for your first 50,000 words; if your manuscript is longer and you wish to have the full novel critiqued, add an additional $0.01/word, payable through PayPal on the WriteOnCon website. You must have a full manuscript ready to be sent! All of these perks won’t be available any other time during the conference. So get ’em while they’re here! And don’t forget our Indiegogo raffle, available for anyone who pays the $5 admission fee!